After successfully funding its Kickstarter campaign, where it reached over 25 percent of its initial funding goal in the first 24 hours, ALKILU has formally begun mass production of its high quality, energy­ efficient and sustainable portable lamp - available for purchase now at http://www.alkilu.com. 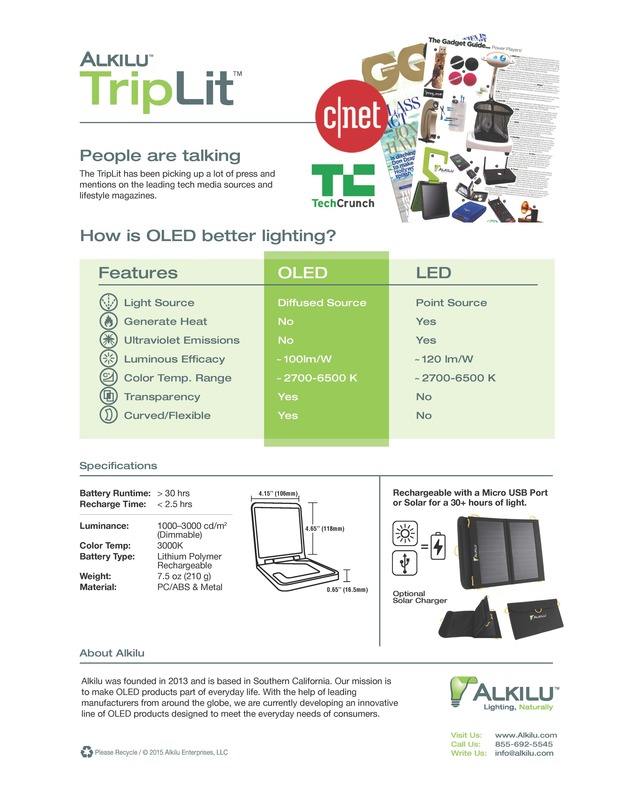 TripLit, the organic light emitting diode (OLED) lamp, is the first affordable consumer product of its kind to hit the market and can travel easily with users anywhere and everywhere. It can be used for multiple outdoor activities, from camping to sporting events and everyday tasks, TripLit has the ability to last over 30 hours with no replacement batteries needed. All users need is a readily­ available micro­USB or ALKILU’s high ­efficiency Solar Charger to fully charge TripLit in a few hours. The ALKILU team is focused on creating an inexpensive device that would have less impact on the environment and provide a safer lighting alternative for users by eliminating UV rays; providing the closest thing to natural lighting that won’t attract bugs or produce heat, making it safe to touch and usable during all activities. TripLit’s built­-in hook makes it easy to hang inside tents or on trees, and it can easily be extended or flipped to sit on any surface, for ambient or task lighting. It also comes with three dimming levels for a myriad of different applications - such as a desk lamp. ALKILU utilizes OLED panels from LG Display for TripLit’s internal lighting system. 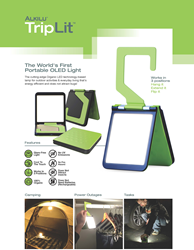 Paired with the included high current wall charger or the compact solar charger with dual-USB ports in the combo pack, TripLit is the perfect lighting device to include in an emergency preparedness kit, car's accessory box or in a travelers' backpack.